Many of Iran’s once flourishing wetlands have dried dramatically in recent years. Lake Urmia in particular is the sixth largest salt lake in the world and a UNESCO Biosphere Reserve, is dangerously receding and threatens to vanish entirely . 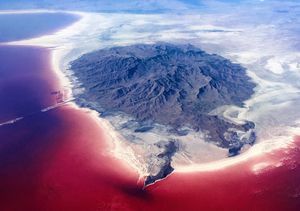 Waters of this salty Lake, which are normally aquamarine or various shades of green, became blood red ,so i called it red pain .